The apartment in Ses Covetes has 2 bedrooms and has capacity for 4 people. The apartment is homelike, is very luminous, and has 60 m². It has views to the sea. 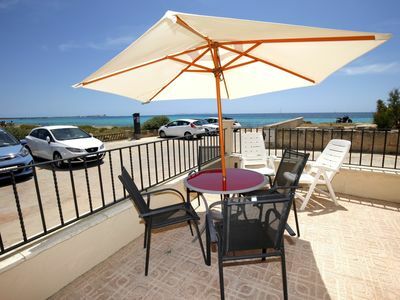 It is located 0 m from Es Trenc sand beach, 0 m from Ses Covetes rock beach, 0 m from Ses Covetes city, 0 m from Supermercado local supermarket, 10 km from Supermercados Eroski, Lidl, Mercadona supermarket, 35 km from Aeropuerto de Mallorca airport. The house is situated in a family-friendly neighborhood next to the sea.The accommodation is equipped with the following things: garden furniture, 20 terrace square meters, iron, internet (wifi), hair dryer, electric heating, open-air car parking in the same building, tv.In the butane gas independent kitchen, refrigerator, microwave, oven, freezer, washing machine, dishwasher, dishes/cutlery, kitchen utensils, coffee machine and toaster are provided.